As a kid, Joel Martin couldn’t get enough of the culinary fare at the popular Hot Diggity Dog at Eight Mile and Greenfield in Detroit. Martin also is an avid collector of items designed during the Atomic Age, of the period during the 1950s and ’60s when nuclear war was a concern. Pairing the two passions, he opened the Atomic Dawg in Berkley two years ago. The restaurant, located in a two-story building along Coolidge, just south of 12 Mile, was crafted from a former creamery and is now outfitted with 1950s neon fixtures, silver stools, and various pieces of period furniture. “At some point, I wanted to do a food truck, and since Airstreams come from that era, I knew that was the direction I wanted to go,” he says. Researching his options, Martin learned hot dog carts in urban areas were often “grandfathered in,” meaning a non-motorized stand on wheels, with the requisite licenses, could be used in populated areas. “We can be on sidewalks, rent areas in parking lots, and we can be on Woodward Avenue at night when there’s a big event — which we’ll let people know about via social media this summer,” Martin says. For the cuisine, he and his cousin, Bobby Schnitzer, a longtime food services expert, hit the road. The finest hot dogs, the pair determined, are Hoffy’s natural casing beef frankfurters, produced since 1939 in Los Angeles. “They use gourmet beef, and have a mild smokiness and the right snap,” Martin says. Nearly everything else is local, including handmade sausages from Corridor Sausage Co. in Eastern Market. Martin brought in Chef Gary Brunner to create the Benicio Del Toro, the Santa Fe, the Hula Dawg, and a dozen other frankfurter and sausage selections (split, grilled, and filled). There are also burgers; a grilled, five-cheese sandwich; chili; a few sides; and shakes, malts, and floats. 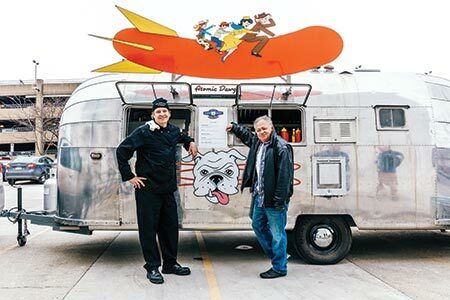 In addition to the trailer, which is available for catering, Martin is perfecting a series of hot dog carts — each one is half the size of his 20-foot-long Airstream (“half-pint trailers that can be operated by one person”) — and selling them. He already has orders from Rockaway Beach in Long Island, N.Y., and Del Ray Beach, Fla., in addition to three other stands that he plans to build and sell this year. “That’s our capacity, but we plan to build more next year,” he says.